The ICC has announced its 2016 Test and ODI teams; annual listings that recognise the top players in international cricket over the season. New Zealand fans and punters will be thrilled that Black Caps skipper Kane Williamson has been named on the 2016 ICC Test Team, the third year in succession that the international body has conferred this all-star status on him. It’s a welcome cherry on top of a 2015/16 season that, although it saw Williamson’s individual game and captaincy flourish, has been up and down for New Zealand. A 2-0 Test series loss away to Australia in November 2015 was followed by another 2-0 loss at home to the same team in February 2016. A comprehensive series win, in all three forms of the game, against Sri Lanka in December 2015 may have lifted Kiwi fans’ spirits for a while. But the 3-0 Test series drubbing by India in September this year was nothing to celebrate, and the less said about the South African tour, the better. But the 2-0 Test series win against Pakistan in November 2016 was satisfying, as was taking the December 2016 ODIs against Australia 3-0. 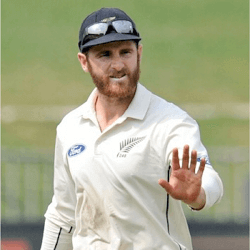 Since he took on the New Zealand captaincy in all forms of cricket in March 2016, upon the retirement of Brendon McCullum, Williamson has had to cope with the added pressures of the skipper role on top of his team’s batting expectations. He’s risen to the challenge with some excellent captaincy combined with superb performances, most notable in the two tests played against Zimbabwe in Bulawayo in November. As expected, the Black Caps achieved a convincing whitewash in the two matches, but Williamson also became the youngest of 13 New Zealand players ever to have scored Test centuries against all the Test-playing nations. He also accomplished the feat in fewer innings than any other NZ player, with the shortest time between his debut and achievement of the record. So his inclusion in the ICC Test Team 2016, batting at number three alongside other greats of the game, like Australia’s David Warner at opening bat and England’s Peter Cook the captain at number two, is well-deserved. It’s a fitting jewel in the crown of a year that also saw Williamson win NZ Player of the Year and Test Player of the Year, plus his second Redpath Cup in a row.